The new 8-channel PC oscilloscope from Pico Technology offers the perfect solution for advanced multi-channel applications. Housed in a compact and rugged enclosure, the PicoScope 4824 features 12-bit resolution, SuperSpeed USB 3.0 interface, and an integrated 14-bit arbitrary waveform generator (AWG). Managing Director Alan Tong explains “The new 8-channel PicoScope has the same small footprint as Pico’s existing 2 and 4-channel models, and can replace the cumbersome full-sized scope on your workbench”. Like all PicoScopes, the 4824 is small, light, and highly portable; despite its high specification it is entirely powered via USB and does not require a bulky separate adaptor. With 8 high-precision, low-noise inputs, a bandwidth of 20 MHz and sensitivity from 2 mV/div, this scope is well suited to a broad range of applications such as power supply start sequencing, decode and time-aligned display of related I/O, 7‑channel audio, 3‑phase voltage and current measurements, and multi-phase motor drives. The maximum sampling rate of 80 MS/s, deep buffer memory of 256 MS and data streaming enable the scope to capture detailed timing data over prolonged periods. The PicoScope 4824 includes a comprehensive list of features as standard, such as a 20 MHz FFT spectrum analyzer, segmented memory (for bursts of up to 10,000 captures in less than 30 milliseconds), math channels, automatic measurements, color persistence display mode, advanced digital triggering, mask limit testing and serial decoding (SPI, I2C, I2S, RS-232/UART, CAN, LIN and FlexRay). A free SDK is also included for developing applications in various popular programming languages including C, Microsoft Visual Basic®, National Instruments LabVIEW® and MathWorks MATLAB® with example code available at www.picoapps.com. 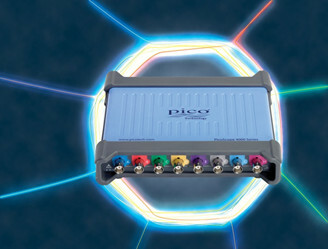 The PicoScope 4824 oscilloscope is available now from Pico distributors worldwide and from www.interworldna.com, priced at only $2,302 USD (£1395 or €1688). This includes all of the features mentioned above, plus USB 2.0 and USB 3.0 cables and a 5 year warranty. Pico Technology has spent over 20 years leading the industry in the design, development and manufacture of high-performance PC Oscilloscopes and Data Loggers. During that time we have built up an impressive portfolio of products and high-integrity measurement technology including the PicoScope PC Oscilloscope range with bandwidths up to 20 GHz, resolutions up to 16 bits, flexible‑resolution and mixed-signal models; Temperature Data Loggers; and the multi-award-winning Automotive Oscilloscope Kit. Pico Technology prides itself on offering innovative, high-quality and affordable alternatives to traditional bench-top test and measurement equipment, designed and built under the ISO9001:2008 quality system. We support a network of distributors in over 60 countries worldwide who are helping to build and maintain our enviable reputation in the industry. Pico Technology and PicoScope are internationally registered trademarks of Pico Technology. Pico Technology is registered at the U.S. Patents and Trademarks Office.